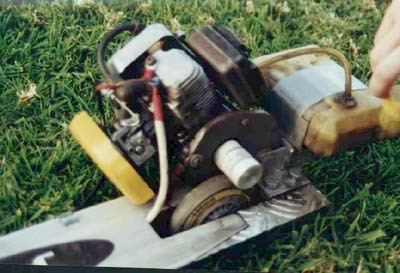 The wheel is driven by a 30mm dia spindle which is mounted where the pullstarter used to be, so all you had to do to start it was push it down the road. I have driven it this way because basically the motor would stick out too much if I droved it through the clutch, plus I think it would slip aswell. The main problem was tyre wear, and the fact that the wheel were only 100mm scared the hell out of me when I flew past any small rock. I have since bought a larger "air lite" scooter and have mounted the motor on that, but now I have the need for speed and I am going to get a much bigger motor and probably use a belt drive system.